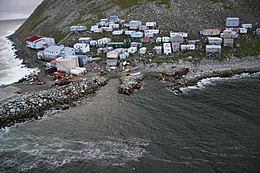 The native Inupiat village of Diomede/Inalik on Little Diomede Island. 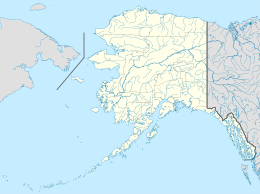 Little Diomede Island (Inupiat: Iŋaliq, formerly known as Krusenstern Island [a] , Russian: Остров Крузенштерна, Ostrov Kruzenshterna) is an island of Alaska, United States. It is the smaller of the two Diomede Islands located in the middle of the Bering Strait between the Alaskan mainland and Siberia. Little Diomede's neighboring island, Big Diomede, is about 2.33 miles (3.75 kilometers) to the west, but is part of Russia and west of the International Date Line. Unlike its larger Russian neighbor, Little Diomede retains a permanent native population. As of the 2010 census, Little Diomede had a population of 110, down from its recorded peak of 178 in 1990. The entirety of the island is in the City of Diomede (Inupiat: Iŋaliq meaning "the other one" or "the one over there"). The island is not part of any organized borough, so some services are provided directly by the state. For census purposes, it is included in the Nome Census Area. During the Cold War, the section of the border between the U.S. and the USSR separating Big and Little Diomede became known as the " Ice Curtain". In 1987, however, Lynne Cox swam from Little Diomede to Big Diomede (approx. 2.2 miles (3.5 km)) and was congratulated jointly by Mikhail Gorbachev and Ronald Reagan. Satellite image of the Bering Strait; Little Diomede Island can be clearly seen in the middle of the strait, to the right of Big Diomede. According to the United States Census Bureau, the island has a total area of 2.8 square miles (7.3 km2), all of it land. On the western shore of the island is the village of Diomede, also known as Iŋaliq. 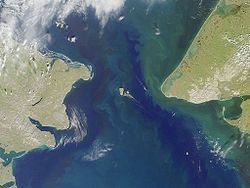 Little Diomede Island is located about 25 kilometers (16 mi) west from the mainland, in the middle of the Bering Strait. It is only 0.6 kilometers (0.4 mi) from the International Date Line and about 2.4 miles (3.9 km) from the Russian island of Big Diomede. The highest point on Little Diomede Island is 494 meters (1,621 feet) (about halfway along the west coast, about 1.5 miles (2.4 kilometers) southeast of the village, facing the southern tip of Big Diomede). There is a heliport, the Diomede Heliport, with regular helicopter flights. During the winter, the villagers carve a runway into the thick ice sheet so that bush planes can deliver vital products, such as medicine. Due to annual variations of the ice sheet, the runway changes position every year. The Little Diomede island is composed of Cretaceous age granite or quartz monzonite. The location of the city is the only area which does not have near-vertical cliffs to the water. Behind the city and around the entire island rocky slopes rise at about 40 ° up to the relatively flattened top in 1,148–1,191 feet (350–363 m). The island has very scant vegetation. ^ "Palin's Travels - Full Circle". PalinsTravels.co.uk. Retrieved 8 March 2016.